Back in 2002 I went to meet Henry Azima in NXT’s Huntingdon technology centre where I saw a whole host of interesting speaker-related goodies, but something really caught my attention. It sounded big and powerful, yet clean and sweet and open, so I was amazed to discover that such a sound was coming from two tiny satellites and a small sub plonked unceremoniously on the floor. “What on earth is that,” I asked, “and when can I have one for review?”. To my dismay, I was told that the mystery speaker system in question was only available in the US as the TDK Tremor, and it probably wouldn’t be coming to the UK. I was crestfallen, but so impressed that I resolved to pick up a pair when I next went across the pond. Whilst at NXT towers, the ‘politics’ of the panels was explained to me. It was all pretty tedious, until I realised why it accounted for the swingeing sonic gap between the FS-mm1 and the Tremor. All R&D is done in-house at NXT, and then the company licences it to third parties along with a package of software tools for outside designers. The FS-mm1 was done this way, by Mission’s own engineers using NXT support. The Tremor however, was a bespoke NXT design, using a newer generation of panels and NXT’s very own R&D bods. It was then licensed to TDK to manufacture at their facilities. Effectively then, the Tremor was a pure, state-of-the-art NXT design ‘from the horse’s mouth’, so to speak. After picking up the CES Innovations 2001 Design and Engineering Award, the Tremors finally reached the UK as a £90 system for ‘PCs, Game Consoles and Portable Stereos’. Amazingly though, my ears told me that they’re more than just a multimedia loudspeaker system. Like the NAD 3020 of yore, this is a budget product that is far, far better than its intended market would suggest. Of course, I’m not saying you can bin your MartinLogans, but they give a taste of something that you’d otherwise have to spend thousands on to savour. Think of them as baby electrostatics, possessing something that practically no moving coil loudspeaker does – a smooth, even, hear-through clarity with incredible walk-around soundstaging. This is not what you’d expect from something costing under a tonne! 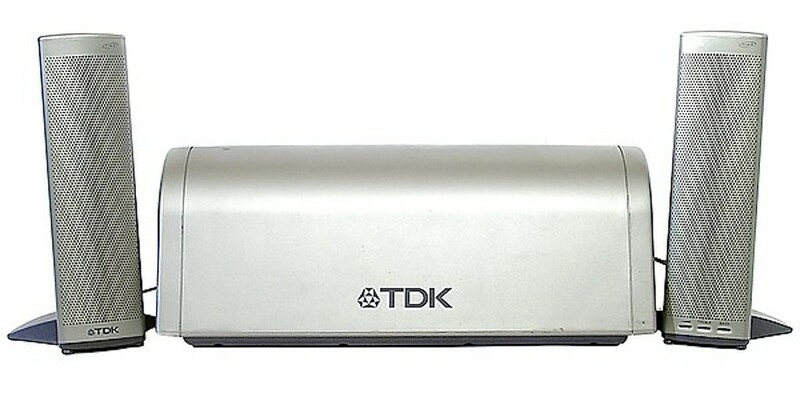 The larger in TDK’s XS-iV Multimedia Speaker System series, the S80 system comprises a silver finished, plastic tube-loaded subwoofer, inside which is an active crossover network splitting the signals at 250Hz. It also houses separate power amplifiers pushing out 7.5W RMS into each satellite, plus 25W RMS into the sub. Together, the overall power output is quoted at 40W, with a frequency response of 60-20,000Hz. The satellites themselves are super-slim affairs complete with sleek metal grilles and their own baby stands. Iinjection-moulded frames house SurfaceSound panels made from super-rigid glass reinforced composite, moved by two inertial exciters using high flux neodymium magnets with liquid cooling. Each sat plugs into the sub (one via a 3.5mm mini-jack, the other via a DIN plug), and there’s a 3.5mm line level input on the sub to get the signal in. They sound staggering – considering the size and price. Place the satellites a couple of metres apart and the sub just off the floor (it has a tendency to boom a touch too much), and connect up to your source with a high quality interconnect, and you’ll be gobsmacked. The sound is smooth and airy, with oodles of detail, tremendous speed, excellent attack transients and an incredible lack of boxiness. It simply floats in mid-air with complete, giving a massively impressive ‘wall of sound’ than you can’t get enough of. The amazing thing is when you go back to conventional box loudspeakers – which sound slow, leaden, wheezy, imprecise, shut in and boxy by comparison – electrostatic users will know what I mean! Of course, they’re not perfect. The sub is a very well designed little thing, but you can’t help hearing its radically different character. It’s notably slower and more ‘plummy’. Place it carefully – mount it on spikes – and things get better, but you’re always aware that it isn’t as magnificent as those panels. Still, the overall effect is superb. Unlike the FS-mm1s and the X-Space before them, these have a deliciously subtle and sweet treble – at the price it’s staggering. The whole plot sounds beautifully sophisticated yet lightning-fast and musically involving. Of course, it doesn’t go particularly loud, but whether it’s a high end turntable and valve preamp or a humble iPhone you plug in, you’ll still be amazed.